The Friendship Force International is an international non-profit organization founded to promote friendship, goodwill and understanding among the world's people. The organization creates an environment where personal friendships can be established through international home stay exchanges. Force achieves its goals through the travel of goodwill ambassadors to pre-assigned destinations. In each city, the ambassadors share the lives of their host families for one week. Established in 1977 by Wayne Smith with the support of President and Mrs. Jimmy Carter, Friendship Force has grown into an organization of 50,000 members in 58 countries. There are nearly 350 clubs around the world with about 135 clubs in the United States. The headquarters of Friendship Force International is in Atlanta with George Brown as President. The Dallas club was established in 1994 and now has membership of over 100 people from all walks of life - professionals, seniors, singles, couples, families - anyone who loves to meet new friends at home and abroad. The club has enjoyed wonderful outbound exchanges to Australia, New Zealand, Thailand, Brazil, Chile, England, Cuba, Japan, Belgium, Germany (twice), Croatia, Columbia (twice); Romania, Costa Rica, Turkey, Canada and Panama. We have hosted clubs from Germany (four times), Chile, Latvia (twice), Peru (twice), Brazil, Japan (twice), England, Canada (three times), Romania and Australia. We have also had outbound domestic exchanges to Fort Worth, Asheville NC, Lake Hartwell GA, Harrisburg PA, San Francisco Bay Area, Sacramento, Cincinnati, Morganton NC, Great Falls MT and Northern Colorado, Columbia Cascade (Portland, OR and Vancouver, WA) and Olympia, WA. For more information about Friendship Force International, club contacts and trips offered, please see their webpage at www.thefriendshipforce.org. See Friendship Force History on another page. This is our logo, a custom design for us by Iconologic in Atlanta. This logo represents who and what Friendship Force is today. The multiple colors connote diversity. Not just two people shaking hands but people of many skin colors coming together. It is an intentionally abstract symbol…meaning it can suggest to each person what speaks to them. An invitation into the world of friends to get to know us better. To promote world peace and understanding by creating an environment where individual friendships can be established across the barriers that separate people. Friendship Force International is a non-profit organization dedicated to the principle that each person can make a contribution to global goodwill. Home hospitality - the heart of a Friendship Force exchange- provides the opportunity for people of different countries and cultures to connect at a personal level. More than half a million participants have experienced the personal enrichment and cross-cultural understanding that results from a Friendship Force exchange. The ever-widening Friendship Force global network represents a powerful and growing force that can overcome differences between people and nations. As a member of the Friendship Force, I recognize that I can make a difference. I recognize that I have a mission. That mission is to be a friend to the people of the world. As I embark upon this adventure, I know that others will be watching me. I know that through my example to my fellow citizens and the people of other countries, the cause of friendship and peace can be furthered. Using simple tools of friendship, FFI promotes global understanding across the barriers that separate people around the world by conducting 400 programs every year, in 377 communities in 70 countries. When you travel or host with the Friendship Force, you get to know real people by sharing real life. Since 1977 when founder Wayne Smith and US President Jimmy Carter introduced FFI at a White House gathering, one million people have participated in Friendship Force International's unique cultural exchange programs. Our work creates global cooperation and collaboration at the personal, human level - beyond governments and borders - where people live, work, play and explore in everyday life. FFI's efforts have been honored with a Nobel Peace Prize nomination in 1992. 2019 World Conference Registration - Now Open! Registration for our 2019 World Conference is open now! Reserve your spot to join us and members from around the globe in beautiful Boulder in July for a one-of-a-kind Friendship Force experience! Editor’s Note: Board of Directors Chair, Jo Custead, of FF Saskatoon, Canada, shares a summary of highlights below from the March 2018 Board Meeting. The Board approved the development and deployment of a global satisfaction survey that will gauge the strengths and weaknesses of the organization from year to year. The survey will give all members the ability to provide feedback on aspects of the organization. This new tool will be deployed in multiple languages annually. Upon reviewing the proposed redevelopment of the International Advisory Council (IAC), the Board approved the first slate of advisors – a group of prospective candidates that will be approached to join the IAC this year. The overall goal is for the IAC to be comprised of well-known public influencers that represent the diversity that exists within the Friendship Force membership and publicly promote the mission and vision of the organization. After reviewing a report on the financial status of Friendship Force International, the Board of Directors was pleased that for 2017, and for the first time in several years, the organization finished the year strong and ahead of budget. The Board is optimistic this is a reflection of renewed strength and vitality in programs. The Board received a report on the ongoing re-development of the website and database, specifically focusing on the next steps to deploy more tools for members and clubs. Additionally, the Board approved the development of a member portal, which is the next step in creating a more secure and personal online experience for members. The member portal will be password protected and each member will receive a unique login. Once logged in, members will be able to build their secure online profile, make Journey payments, track and log experiences with Friendship Force, and connect with the Friendship Force global community. In time, the member portal will be able to provide access in a number of foreign languages. Members of the Board examined how remote members may be recruited, connected with our mission, and inspired to start a club in their community. The support structure for global membership is still in development and a work team has been formed to continue its development. The Board devoted some time to looking at Friendship Force’s ongoing club development initiatives, specifically efforts to strengthen current clubs and enhance recruitment efforts and to establish new clubs. The Board was pleased with the considerable progress made in marketing, public relations, and the utilization of technology towards these efforts, but recognizes there is still much more to be done. The Board received a comprehensive report and engaged in lengthy discussions around revisions to the financial fee structure for Journeys. Challenges with the current fee structure are that it is not equitable for shorter Journeys, it does not take into consideration currency fluctuations, and there are questions about domestic vs. club vs. inter-European exchanges as well as the rate justifications. The Finance Committee will take the research and discussion from the Board and create a proposal to be presented later this year. The Board approved the increase of the member affiliation fee to $20.00 USD per member starting in 2020, noting that it has been nearly seven years since the last adjustment and the costs of doing business naturally rise. Jeremi Snook spent some time outlining the ongoing development of the next organizational strategic plan that will carry the organization from 2019 to 2021. The plan, currently in draft form, will continue to undergo modifications as feedback from leaders throughout the organization is incorporated in the final product. An official announcement and educational campaign around the new plan is projected for fourth quarter of this year. On a joint meeting day, FFI Staff and the Board of Directors met to rework the awards and volunteer recognition process for FFI. Awards were postponed in 2017 due to lack of participation by clubs in previous years. The Board and staff came up with a number of ways in which members and clubs can be honored for their contributions to our mission. FFI staff is working to finalize the awards and recognition process that will be announced in the coming months. All of us on the Board are pleased with the progress over the past several months and the encouraging reports received and discussions that took place during this meeting in picturesque Asheville. We look forward to keeping you all informed with updates as the year continues! UPDATE 2017: Friendship Force has a NEW VIDEO - great! There is also a new tag-line: Experience different views. Discover common good. A pdf file of new policies is available with some additions to the 2016 changes. Click here. The following is a summary of policy changes in 2016. One of the decisions that came out of the International Board of Directors meeting this past March was the unanimous approval for the World Conference to take place every other year. After the 2017 World Conference in Manchester, England, the next will be held in 2019. This change has been discussed for many years and is already being welcomed as a long-overdue adjustment by several clubs as they look for ways to improve the quality and attendance at their regional conferences. Background: It has always been a struggle to fill our World Conferences to capacity. Full conferences such as those in Washington, D.C. in 2010, New Orleans in 2013, and Vancouver in 2015 are the exception. Most years we have as many as 100 spaces left available to sell, which amounts to lost revenue for FFI, not just in terms of conference fees, but also the cost involved with planning the conference. These empty seats also mean lost opportunities to share with, educate, and learn from our attendees. Does having the World Conference every year spread us (and our attendees) too thin financially and dilute the conference’s appeal? At FFI we’ve been asking this question for a few years now, and we’ve toyed with the idea of having it in alternate years. Now, as we approach our 40th anniversary year, the time seems right for this change. The importance of the events planned for 2018 and in subsequent “non-conference” years cannot be understated. These respites from World Conference preparation gives all of Friendship Force an opportunity to plan a slightly smaller, alternative event, such as a friendship festival or development project that aims to enhance our mission and progress in some way. As we institute this change, we want to hear from you! What would you like to see at future World Conferences? What events might you like to see in the non-conference years? In advance of the debut of our NEW website (2017-coming very soon! ), we wanted to share with you some minor changes made in the terms used to describe some Friendship Force program experiences. With the goal of opening our mission to more potential members around the world, we want to use terms that more accurately describe and reflect the FFI experience. Don’t worry - it's still the same FFI you know and love, but now you'll be able to explain it better! We often hear that calling our travel and hosting programs “exchanges” is confusing, since the word no longer directly explains the programs we offer. While they are cultural exchanges, our programs are rarely reciprocal trips as originally developed, where one group directly “exchanges” with another. At FFI headquarters, we strongly feel that a more transformational term - “journey” - is better suited to the amazing programs our members plan and experience. Additionally, market research conducted on FFI’s behalf in eight countries revealed that the phrase “journey” best described Friendship Force programs and activities. You will see this new term (planning a "Journey" instead of an "Exchange") used throughout our new website and in FFI communications and materials from here on out! In line with our incorporation of the word “journey,” we also have altered the term Exchange Director to now be called "Ambassador Coordinator" and "Host Coordinator." Not only does the term “coordinator” translate well into the many languages spoken by our members worldwide, but we also believe it reflects the variety of work that our dedicated ambassador and host leaders undertake in planning a Friendship Force Journey. For each Journey listed on the catalog, there will be an expanded Itinerary section highlighting the mission of FFI and especially our people-to-people focus of travel and hosting. We want to encourage new members to participate by giving them more clarity about what to expect on a Friendship Force Journey. These itineraries are not meant to be exceedingly detailed or sightseeing-focused, but to indicate the time our ambassadors have with hosts, with the group in general, and possibly on their own. In order to overcome the misconception that we might be "just another travel club,” we want to demonstrate how our hosts and ambassadors have ample time to share meals, make connections, and go off the beaten tourist path together. These itineraries will all have a caveat that they are subject to change, as flexibility is an important part of being a good FF ambassador. Overall, we strongly believe this will allow for more effective recruiting, clearer communication, and a continued focus on our mission throughout each Friendship Force Journey. As we enter our 40th year, we know that some change and growth is necessary for the health and future of our organization. We hope that you, our members, will embrace these small adjustments in terminology in order to highlight and continue supporting the mission of promoting global understanding across the barriers that separate people. * Be sure to view our expanded itinerary section on each Journey Catalog listing by clicking “Itinerary” at the top. * Also check out our detailed “Activity Level” in the “Details” section of each Journey Catalog Entry. *As always, the Member Resources page link can be found at the footer of every page. On January 23, 2017, Friendship Force International received the Annual Grantee of Merit Award for 2017 by the Open World Leadership Center. The Annual Grantee of Merit Award is presented to organizations who have demonstrated outstanding service to Open World Leadership Center. Open World Leadership Center is a legislative branch agency that supports Congressional outreach for Members of Congress and conducts exchanges that establish lasting professional relationships between emerging leaders and their U.S. counterparts in democratic institutions. Delegates are provided with extensive exposure to American politics, civic life, and are hosted by American families. In 1999, Congress established Open World. Since then, more than 26,000 Eurasian leaders are alumni of Open World. FFI hosted its first Open World delegation in 1999. From 1999 to now, Friendship Force clubs just like yours have hosted 2,085 Open World delegates. In 2017, Friendship Force clubs will host 16 delegations from the countries of Kazakhstan, Ukraine, Tajikistan, Russia, Kosovo, Serbia, and Turkmenistan. Topics covered for the Eurasian delegations include: Legislative Development, Healthcare, Education and Innovation, Media Practices, and Accountable Governance. Since Open World’s inception, Friendship Force International has been a dynamic player in building strong peer-to-peer professional programming for Open World’s delegates,” said Ambassador John O’Keefe, Executive Director of Open World Leadership Center. “They understand the issues facing our rising Eurasian leaders in their countries and how to craft a program that links them with their American colleagues to create strategies and solve problems. Elena McCarty, Regional Support Manager and Open World Coordinator, and all of FFI Staff would like to take this opportunity to recognize the contributions these U.S. clubs have made since 1999 through hosting and planning Open World delegations. Thank you and congratulations for the significant work you all have done, all of which helped us receive this honor! 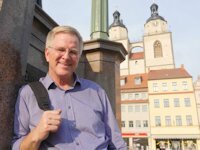 Well-known American travel author and expert, Rick Steves, wrote a blog post on March 15 listing organizations he recommends that provide educational tours and experiences to travelers – and Friendship Force made his short list! Be sure to view Rick’s blog post on the topic (http://blog.ricksteves.com/blog/reality-travel-companies/) as well to share your experiences with Friendship Force! Also check out a photo from Rick’s 2015 visit to Atlanta, Georgia’s local PBS station, where FFI Director of Marketing and Communications, Kaitlyn Ranney, chatted with him about Friendship Force! There will be no change to these fees for 2016. The 2017 Club Charter Renewal fee will be a standard fee for individuals only - there will no longer be a family membership fee. The 2017 Club Charter Renewal fee will be $15 for each individual. This partnership was reviewed further to the May announcement. Given the fact that Homestay.com hosts receive payment for hosting, it was agreed this partnership agreement should be seen as an alternative to hotel stays where no FF hospitality exists. For the same reason, Homestay.com is not seen as a complement to FF hosting as part of the same exchange since it would create two classes of hosts and ambassadors, with unequal host involvement, and lesser benefits to the ambassadors, in the exchange. The Homestay.com policy opposes the mix of FF-hosted and Homestay.com-hosted ambassadors on the same exchange but encourages the use of Homestay.com hospitality for a full group of ambassadors on the same exchange in situations outlined in the policy. The popularity of global exchanges has generated a happy mix of domestic and international participants on the same exchange and numerous questions as to which fee should apply. The policy is simple: domestic fees apply to domestic participants in a domestic exchange. This means that international participants must pay the international standard exchange fee and domestic participants participating in a global exchange in their own country must also pay the international fee. To do otherwise would displace international exchanges in favor of domestic exchanges. Domestic exchanges may be scheduled between two or more clubs within a country after all their regular international exchanges have been confirmed for the coming year. A domestic exchange can be for 1-7 nights with the same host club. Multi-club exchanges are permitted as long as each component does not exceed 7 nights. A nightly fee of $10.00 USD will apply to each night of hosting, irrespective of the duration or location of the exchange for domestic exchanges. Clubs are required to register the visit within 90 days of the exchange. In 2015, bank charges paid by FFI for payment by credit cards of various fees surpassed the year’s total rent for the FF office in Atlanta. These charges are unsustainable for our stressed organization and just as is the case in the commercial world, credit card users must assume a convenience fee for their use. A 3% processing fee will apply to fees paid by credit cards related to exchange payments as well as payments for participation in FFI World conferences beginning on January 1, 2016. This new policy will not apply to credit card payments for Legacy Fund donations or Club Affiliation fees and in these cases, FFI will continue to absorb the bank’s credit card charges. This initiative, piloted as of April 1st, 2015 will become formal policy as of January 1st, 2016. If an exchange is not full at 100 days prior to departure, the exchange must be listed on the FFI online exchange catalog though earlier marketing than 100 days is highly encouraged. A full exchange is one in which the number of ambassadors matches the hosting capacity of the host club. For multi-club exchanges, the hosting capacity of the smaller club will determine the overall hosting capacity. Any exchange of 25 ambassadors will also be considered full. Exchange directors are encouraged to set definite dates and confirm program activities early in their planning process and well ahead of the 100 days. The outbound ED should request advertisement of an exchange on the website catalog as soon as there is any awareness the club(s) cannot fill the exchange with their own membership. Ambassador exchange directors are encouraged to promote their exchange regionally and are welcome to give top priority to applicants from their own region if they choose. Domestic and Intra-European exchanges are excluded from this policy. PLEASE NOTE: In addition to these policy adjustments, please take note that Friendship Force International has recently changed its banking relationship in the US, from Wells Fargo to Bank of America. You, as a leader and member should see no change in your process or service in how you deal with FFI in making payments, but you need to be in touch with your Program Manager for new routing numbers and SWIFT codes for wire transactions and domestic transfers please. 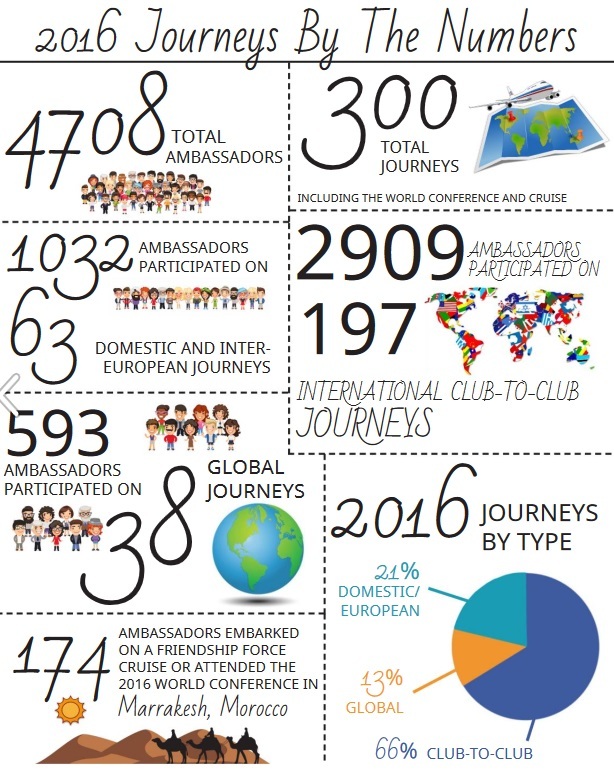 The `2016 Club and Exchange Policies’ are designed to provide guidance and FFI standards for carrying out our intercultural mission across the world. With more than 350 exchanges taking place each year, this set of directions provides a way for us to clearly organize our processes and make sure that Friendship Force programs are based in ethics and professionalism. Should you have any questions regarding these policies, speak with the staff at headquarters, with your club leaders, field reps, or international board members. We greatly value the efforts of all of our global Friendship Force community, and we look forward to a productive and peaceful 2016. With the news full of the threat from IS and many governments expanding their travel cautions, it’s understandable that people feel nervous about traveling. It’s very important, as it has always been, to be thorough in researching our destination and to exercise caution anytime when we travel. The staff at FFI are committed to your safety; we monitor governments’ sites and news resources, and talk to people on the ground so we can stay up-to-date on your exchange and conference destinations. While guarantees are impossible, know that we would not send you anywhere we wouldn’t go ourselves. It rarely happens but when travel to a destination is banned we always act quickly to cancel a program and notify the participants. Anytime you have questions, FFI is here for you. Feel free to also check in with your hosts or the host ED to get their perspective on your destination. Very often it’s business as usual where they live, and they will be able to allay your concerns. Check out award-winning U.S. travel journalist Wendy Perrin’s very educational article from March. The article is written for U.S. readers but the overall message is relevant to all of us, no matter what country we call home. Thanks to our amazing clubs and members, we have now raised $78,995 toward our goal of $100,000! We are so close to fully funding the new website and database, but we still need your help! Please encourage your club to donate if they haven’t already. If you haven’t had a chance to participate in the fundraising effort, there’s still time before our July 1 deadline. Any donation, large or small will help us achieve our goal. Thank you to all who have donated, and join in if you haven’t yet! Any amount is appreciated! If you have questions about how the funds are being used, you can find some of those questions answered on Jeremi’s FFI CEO Blog post. The 38th annual Friendship Force International World Conference in Vancouver wrapped up in early September 2015 and we came to understand that all of us, individually and collectively, must commit to keep Friendship Force strong and adopt specific goals towards our growth. The future of Friendship Force depends on the seeds we are planting now. In light of this, we launched the “I’m In!” Campaign to raise funds for a new website and back-end data management system. We want to make sure that we can serve you and the members to come, and we have no time to waste. Our goal is to raise $100,000 by July 1, 2016 and we are getting close thanks to the generous donations of our clubs and members! For more information on the database and website upgrade, you can visit Jeremi Snook’s blog at fficeo.blogspot.com. If you’d like to say “I’m In!”, you can do that by donating on the FFI website. If you have any questions, feel free to contact Pallie Savoie, who is coordinating these initiatives and can provide more instructions. You can reach Pallie at her email address: `pallie@friendshipforce.org’. As our Friendship Force pledge says, “I can make a difference.” We hope that together we can make a difference for the sustainability of the organization we all love. Next Generation refers to creating an environment open to change in order to make your club sustainable into the future. This means thinking differently, planning differently, formulating differently, trying new things and being more open. If your club needs to grow membership, then you may need to change the way you attract and retain new members, especially younger people. Club leaders may want to try reaching out to other groups of people to find members, as well as involving the multiple generations of their own family. This may require changing the image that your club portrays. Clubs may want to change the way they conduct business. By scheduling a variety of fun and enriching activities, this may keep the members engaged. And having some flexibility may allow members with busy schedules, like working people, to remain active in the club. For exchanges, clubs may want to consider adding flexibility, options, more authentic cultural experiences, themes, shorter exchange lengths and/or adding a humanitarian activity to their exchanges to attract a new type of member. If you want to plan an exchange with NextGen activities, contact Laura Romero at FFI at laura@friendshipforce.org. We would like to thank and recognize the contributions that the NextGen mentors have made to developing the training materials and advice regarding the NextGen concepts and how it can apply to you and your club. The NextGen mentors have shared their ideas and experiences with us and we are very grateful. Please feel free to reach out to them to offer your thanks, feedback, suggestions, or request advice on how you can apply NextGen ideas to your club activities. Mentors are experienced Friendship Force members from around the world who can listen to your club’s needs and help guide you to find resources. What resources have been developed? On the FFI website, the Leadership Toolkit contains presentations, documents and videos on a variety of topics, including NextGen. Club leaders can select the information which may best match the needs of their club. How can you share your NextGen success story? Clubs around the world are doing great things and we need to share our success stories. 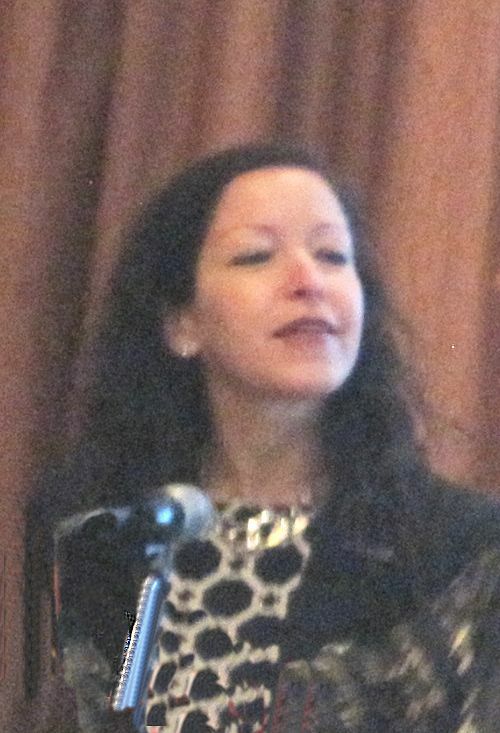 If you have a NextGen success story, send it to Laura Romero at FFI at laura@friendshipforce.org. Friendship Force has enrolled in Delta Airlines’ SkyBonus program. Now, you can support FFI when booking flights directly through Delta, while still earning your own SkyMiles rewards!To use this option, simply enter FFI’s account number US0038351 in the SkyBonus ID field in the Passenger Information section on the Review and Purchase page. SkyBonus points can not be earned on tickets booked through discount travel websites to include, but not limited to: Expedia, Orbitz, Travelocity, or any tour wholesaler / consolidator, such as Delta Vacations. FFI will earn SkyBonus points when our members fly on Delta, Air France, KLM Royal Dutch Airlines, Alitalia, or any of their participating codeshare partner airlines. Meanwhile, you will still continue to earn miles in the SkyMiles program. Have questions? Read more on the SkyBonus FAQ on the Delta website. Thanks to you... we have a plan! Over the last 18 months, your FFI staff and Board of Directors have been working hard – listening, asking questions and talking to as many of our members around the world as possible - asking you what you want out of the organization we all hold dear and share. 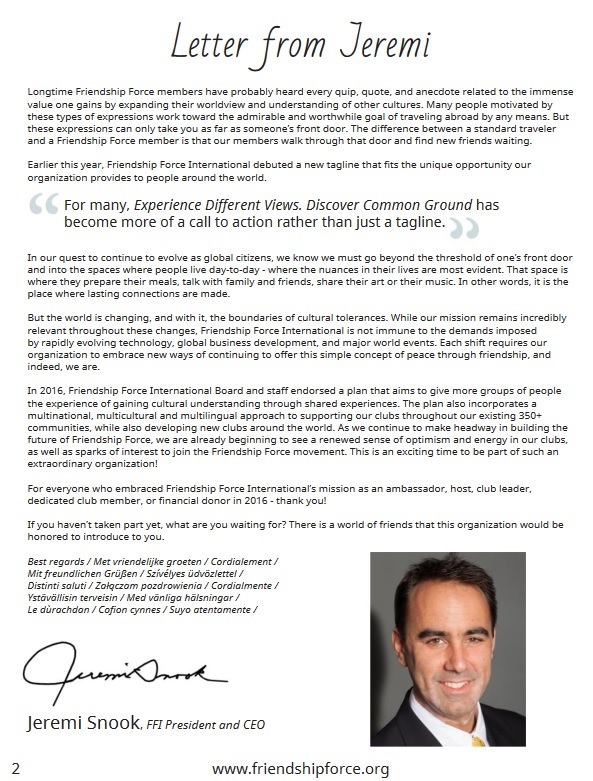 With your collective voices, ideas and information in mind, we have developed the new 2015-2018 Strategic Plan for Friendship Force, in order to define a new direction with bold, clear initiatives that will help to focus us all toward our goal of building a bright future for our legendary community - and for the next generation. As always, our first and most important goal is to engage as many people as possible in our movement of friendship and in our signature programs. Each of the eight initiatives was written with this goal in mind. Many clubs and volunteers, as well as the FFI staff, have already begun implementing new and creative strategies to include more people in our important mission. These efforts in the year 2014 form the foundation for this new strategic plan. Your determination and your creativity have kept our organization strong and have inspired this plan. We thank you for your feedback and terrific ideas, as well as the many solutions you yourselves have offered us. From here, we will need your help to make this plan a success. We will be calling upon the many people who have already raised their hands and said, "We want to help." We are grateful for your support. We look forward to working together with you throughout the 2015-2018 period. With an esteemed legacy behind us, we are committed to paving the way for a vibrant future ahead - a future of more friendship for all. Please let us know your questions and ideas, and let us know if you want to share this work with us. Hello Friendship Force members around the world! I truly hope this note finds you doing well and enjoying the season wherever you may be in the world. Here in Atlanta the weather is getting warmer and the sun stronger. I wanted to share some exciting news with you all that we at FFI believe will be helpful towards achieving the goals we have set for ourselves in our 2015-2018 Strategic Plan. We’ve recently made some staff changes in the head office that are designed to strengthen our team, refocus our initiatives and help us to grow and sustain the Friendship Force long into the future. - Matthew Nidek, who has previously been the program manager in charge of the South Pacific region has assumed the position of Director of Programs and Leadership Initiatives. In this role Matthew will focus his attention on the successful implementation of Friendship Force’s vibrant slate of global exchange programs and leadership development efforts throughout the organization. - Ana Smulski, who has previously been the program manager for Brazil & Argentina as well as being FFI’s network engineer, is now Deputy Director, Program Development and Research. In this newly created role, Ana will work on developing FFI’s full range of exchange programs – along with our Planning Manager, Kristin Harrison – in order to grow and expand FFI’s exchange offerings across the world. Ana will continue to manage her exchanges and clubs in Brazil and Argentina. - Ebony Rogers assumed the role of Director of Finance and Administration in which her responsibilities include overseeing FFI’s finance activities and organizational management. - In April, Joi Fitzgerald became our full-time bookkeeper. Having worked part-time with FFI for several months, Joi will bring much needed support to the FFI finance department. - In February, Maggie Smith became our full-time Communications Coordinator & Graphic Designer. Maggie had worked with FFI on a part-time basis since 2013. As full-time communications coordinator, Maggie is revitalizing the FFI website, catalog and promotional emails, working alongside Communications Manager Jillian Walters on achieving the goals of the Strategic Plan’s 5th Initiative. In this transition period we also bid a very fond farewell to longtime Germany Program Manager Barbara Stonebrink-Martin, who has left FFI to pursue a local job opportunity in her hometown of Munich. We are currently searching for her replacement. With these appointments we hope to be able to diligently address areas of our organization’s work responsibilities and better serve the needs of our clubs and membership around the world. The rest of our terrific staff in Programs, Communications and Finance – many of whom have been with FFI for years – continue to do awe-inspiring work on behalf of all of you and our beloved organization in service to the legacy we have been entrusted with. On behalf of myself and the staff, we look forward to continuing our efforts together and to building the bright future of Friendship Force which we all envision. he Friendship Force staff and I are so excited to let you know about our new partnership with Homestay.com. Homestay.com brings together travelers and hosts, giving them the online tools to arrange homestays. Like us at Friendship Force, they believe that travel should bring people together, making the world a friendlier, more peaceful place. Here are 5 reasons we’re so excited to partner with Homestay.com! 1. More home hosting in more places. While Friendship Force clubs exist in many places in the world, we are always striving to bring a Friendship Force presence to more communities. Often, we try to do this with Discover Exchanges where FF ambassadors stay in hotels. By partnering with Homestay.com, we will be able to offer a more Friendship Force-like homestay experience in more cities and countries around the world, more quickly. Furthermore, in places where we have limited availability, Homestay.com hosts can provide additional hosting alongside our existing clubs, allowing us to grow our exchange capacity. All in all, the partnership with Homestay.com will mean fewer hotel nights, more homestays, and more friendship. 2. A shared commitment to safe, friendly, people-to-people travel. Like Friendship Force, Homestay.com cares deeply about vetting, security, and orienting participants to a greater mission of global good; and we believe we will find a safe and satisfying partnership in our activities together. Additionally, unlike other home booking sites, Homestay.com hosts stay in the home with you, offering local connections at the personal level. 3. A private web platform just for Friendship Force – coming soon! In addition to their general services, the Homestay.com team is working on tools that will be available just for FF members. You’ll be able to sign up there if you’re willing to host other FF members on their private travels. And the next time you’re traveling on your own, you can use Homestay.com to find a Friendship Force member to host you, too! 4. More opportunities for you to travel and host in the way you love. If you choose to sign up as a host on Homestay.com, you will enjoy more opportunities to welcome visitors from around the world into your home, bridging cultures, generations and ideas. 5. Sharing the mission of friendship. Partnering with Homestay.com will allow our many Friendship Force members to make connections with a whole new community of like-minded people, inviting them to join our mission of creating a better world through global friendships. Homestay.com has 18,000 active hosts around the world who all love the personal connections they make through home hospitality. Imagine how strong the cause of friendship can grow when we work together! Talk to your program manager at FFI headquarters if you’re interested in finding additional hosting availability for your exchange through Homestay.com, and watch for more announcements to come soon. We ask that if you are interested in exploring or using the Homestay.com website, please access it via the links in this email or the link on the FFI homepage. These links, which say "Friendship Force" in the address, help Homestay.com identify you as a member of the Friendship Force. Let’s create more friendship together! The SW Field Reps had a conference call with FFI, chaired by Laurie Ann Scott. Joy was present. Here are some preliminary points. - Discussion on the vetting process. Laurie Ann is leading a committee to come up with a final set of guidelines. These will be presented in Vancouver at the World Conference in August. - The World Conference is currently sold out, a record in terms of time. But FFI is trying to negotiate additional rooms in the hotel/venue to accommodate more delegates. We’ll see. - For 2016, there were 56 requests for 35 open weeks in Canada, so a number of clubs were disappointed. - Reverse situation in the US. The US Clubs had 95 open weeks, but only 44 requests for visits came in, so there is a problem responding to requests for inbounds. - Where a club has made a deal in advance of the annual matching exercise it is important to give Atlanta a head up in advance to avoid complications and conflicts. - Field Rep John Heard emphasized the need to assign exchanges to the new club in formation in Georgetown, Texas, for next year. We don’t yet have enough information to request anything specific. I hope this note finds you doing well and planning a terrific holiday season for you and those you love. We know at FFI that our work cannot be accomplished by only a few people. Indeed, our collective work to make the world a more peaceful and friendly place requires a global village of effort and generosity. We would be nothing without our members, who carry forth our mission each and every time they travel for good, make a difference in their community with their club, or generously support FFI's growth and programs. •Or you can give for scholarship purposes to help a young person learn leadership skills related to global friendship and cooperation work. •You can also join us for special giving days, such as Georgia Gives Day happening today, November 13, or for “Giving Tuesday,” December 2, 2014. Whatever it is you hope to see changed in the world, we can all work together to make it happen. It takes all of us. Please visit our Network for Good donation page to learn more or to make a donation. We thank you, as always, for both your friendship and your support. Ceclile Latour, as Chairperson of the Friendship Force International board, announced the appointment of Jeremi Snook as FFI's sixth President and CEO, effective November 9, 2015. Jeremi has a Master’s degree in Business Administration and experience as a senior executive in the non-profit sector as well as the experience of starting a small business that quickly earned him and his partner the Top 50 Fastest Growing Companies’ award. He worked successively with United Way, with the Uptown Emergency Shelter and most recently as Chief Operating Officer with Spaulding Youth Center in Northfield, New Hampshire, a leading community-based provider of educational services for children with neurological or behavioral challenges. Those on the Search Committee who have met him believe that he has the vision and management skills to lead FFI to the stability and sustainability we want for the organization. Most importantly, he has the values to embrace the mission that matters enormously to all of us. Please welcome Jeremi to Friendship Force family and give him the support he will need to grow our mission and our membership. He will introduce himself to club members around the world in a short message and video that you can watch on your screen after his start date November 9th. Cecile thanks the CEO Search Committee led by the Board Vice-Chair, Bob Duncan, who reviewed 180 applications and worked tirelessly over the last three months to bring us to this day. 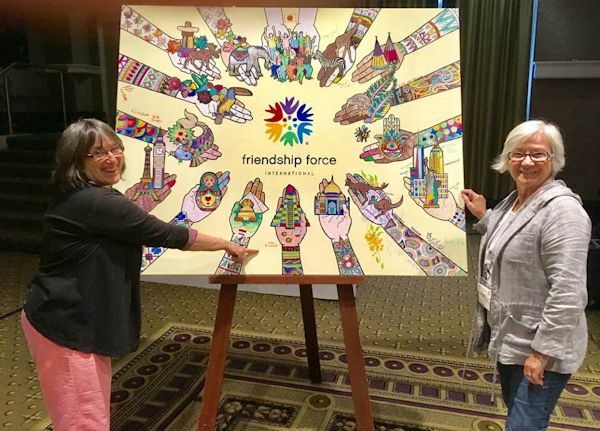 FFI concluded the 2014 World Conference in Auckland, New Zealand held from October 14-16 and was assisted in hosting by the 23 Friendship Force clubs of New Zealand. Hello, Friendship Force members and leaders around the world! I hope this note finds you all doing well as we head into the holiday season. We recently held the 37th annual Friendship Force World Conference in Auckland, New Zealand, with a wonderful turnout and many good friends in attendance. If you were there it was terrific to see you - if you were not there, you were missed. At the conference, we gave a brief review of the results from this past summer’s unprecedented Global Membership Survey. This survey was lengthy (we know!) and we appreciate that so many of you participated in it. Future surveys will be more targeted and shorter, we promise. For now though, these answers have really helped us to connect the dots of our global membership network, and the results are currently being used to finalize the new Friendship Force International Strategic Plan, slated to run from 2015 to 2018. We will be sharing this plan with all of you very soon. In the meantime, we have asked club leaders for comments on certain elements of the plan, due back to us by November 14th. I'm writing to you all today to share the highlights of the Global Membership Survey results, which were shared in Auckland. As we work toward shaping the Friendship Force of the future, we want to make sure your voice and your contributions are included, and these survey results represent some of your thoughts. Click here to download the results (PDF). A most heartening aspect of these results were the hundreds of you who made personal comments and who shared your contact information with us, 'raising your hand' and saying that you want to help us as we grow our extraordinary organization for now and for the next generation. You can be sure we will be calling upon you for support and ideas. Should you have any questions regarding these results, please do not hesitate to ask or make comments: you can reply to this email directly. Please know we enjoy hearing from you. 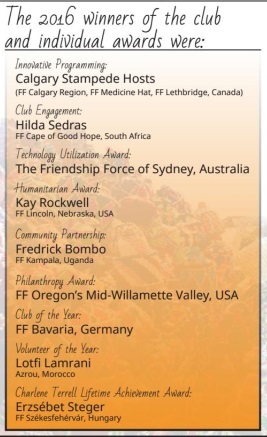 FFI hosted the 2015 World Conference in Vancouver, Canada August 28-31, 2015 with over 500 delegates attending representing 127 clubs from 23 countries; Dallas had 19 people attending - the most of any club. 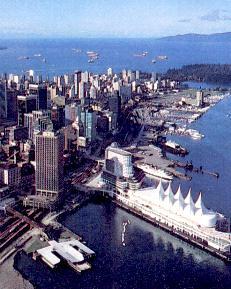 Conference activities took place at the Renaissance Vancouver Harbourside Hotel, hosted by the Friendship Force of Metro Vancouver. Theme of the conference was Buildilng Bridges. Activities began with an evening welcome reception and performance by the Vancouver Men's Welch Chorus on August 28, with the official opening of the conference taking place the following morning. A gala dinner was held on August 30, with the closing of the conference on August 31. Interesting speakers and workshops were held during the three days along with generation of new ideas and commitments to FFI goals. Primary among issues discussed was the inability to fill exchanges, resulting in a pending deficit for the organizaton. Clubs and individuals are asked to contribute to financing a new database and website. Read more about the Vancouver conference on the FFI website, including notes from the presenters and workshop leaders. 180 delegates were in attendance from 17 countries, supported by staff members from FFI Headquarters including including CEO Jeremi Snook, Conference Director Debbie Powell, Director of Operations Matthew Nidek, Regional Support Manager Maryam Jordan, and Director of Marketing and Communications Kaitlyn Ranney. This smaller World Conference allowed for increased collaboration and friendship-building, with many delegates sharing that they were able to make some strong connections due to the smaller size. The World Conference officially began on Friday, with an opening performance by Gnawa of Marrakesh, a musical group performing ancient African Islamic spiritual religious songs and rhythms. 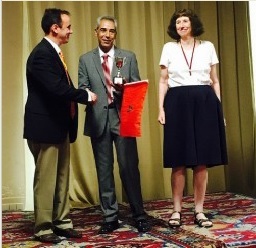 After a warm welcome by Conference Director Debbie Powell and the enthusiastic roll call of countries represented by the delegates, Jeremi and FF Vancouver member (host of the 2015 World Conference) Marian Ennis presented the Host Cup to Lotfi Lamrani. In return, Lotfi gave “Peace Ambassador” medals to Marian and the staff as well. After an introduction by Board members Kurt Haefeli and Dave Kalan, Jeremi Snook took the stage with his discussion “Reflect, Re-Tool, Reinvigorate, Repeat!” which outlined determined paths forward for FFI. A question-and-answer session followed his presentation, with many insightful queries posed by the audience and answered by Jeremi, Kurt, and Dave. That afternoon, delegates participated in a variety of optional tours, including ziplining through desert gorges, camel rides, shopping in the souks or tours of historical Marrakesh. Friday night was “An Evening in the Medina” which began with horse-and-carriage rides from the Kenzi Farah Hotel to the Djemaa El-Fna square in central Marrakesh, where delegates took in the myriad sights, smells, sounds, and entertainment, before a stroll to the Dar Essalam restaurant for a tasty and lively dinner, complete with dancing and music. Throughout the Conference, delegates enjoyed a variety of local cultural activities and workshops, including a bellydancing class, a talk about the production of Morocco’s famed argan oil, and a demonstration of tagine cooking. The schedule on Saturday morning opened with a new program offering of “Unconference” workshops, where delegates could choose from a variety of session topics they themselves wanted to teach to others or learn about. Some of the subjects submitted by delegates were Grandparent/Intergenerational Exchanges, Language Challenges in Exchanges; Innovation in Hosting and Themes and Service and Volunteerism/Voluntourism with FFI. Members had two opportunities to choose amongst these for informal discussion-center hours. All of the subjects and some of the summaries from these sessions can be found here. Other workshop topics that afternoon included Leadership Training, Strategic Planning, Marketing, Recruiting and Being a Good Ambassador (see all materials from these workshops at the “Presentation” tab on the yellow bar above). Donors to the I’m In Campaign enjoyed a special reception that afternoon graciously hosted by Dave and Pat Meyer of FF Northern Illinois, U.S.A., with Jeremi and FFI staff in attendance. Sunday opened with a breakfast meeting of the Field Representatives in attendance, followed by the African Plenary session, which featured several fantastic speakers from around the continent. Mounia Ait Allal began the morning with an interactive lesson of Darija or Moroccan Arabic. Representatives from several African clubs also spoke about their countries, clubs and exchanges throughout the weekend, including Fredrick Bombo from FF Kampala, Uganda; Dela Quarcoo from FF Volta Lake, Ghana; Hanaa Rashad from FF Cairo, Egypt; and Cori Nel and Eileen Bintcliffe from FF Capetown, South Africa. Also on Sunday, delegates heard an informative presentation by Maryam and Skylar Montague of Project Soar, a Morocco-based non-profit organization with the mission of empowering girls. Delegates had the opportunity to donate to Project Soar after the talk and did so generously. The African Plenary concluded with Dr. Rajae Chafil, the Director of Observation, Studies and Planning at Morocco’s Ministry of Environment, who spoke about “The Changing Role of Muslim Women in Morocco” and her work and life. The 2016 Gala Dinner took place that evening, with wonderful cultural dress sported by many delegates, an abundance of Moroccan culinary specialties, dancing, and friendship. The Awards Presentation took place that evening as well, with Volunteer of the Year going to Lotfi Lamrani, Club of the Year going to FF Bavaria, Germany and the newly-named Charlene Terrell Lifetime Achievement Award going to Erzsebet Steger of FF Székesfehérvár (see all award recipients here). Additionally, Jeremi made an announcement about the upcoming 40th Celebration at Sea Cruise taking place in 2017, while also thanking Dave Kalan for his dedication and service and giving away several copies of Charlene Terrell’s The Other Side of the Mountain books. The closing plenary on Monday morning was a look ahead to new projects and events in the coming year. Andrew Kelly of FF Manchester, U.K. changed many delegates’ misperceptions and stereotypes of the 2017 World Conference host city of Manchester, England with a lively and humorous introduction to his beloved city. Debbie and Jeremi then drew tickets to select the winners of free conference tickets to Manchester, deciding to choose four winners instead of the original two, sending four lucky delegates to the exciting 40th anniversary conference in Manchester in August 2017. After the final break of the weekend, FFI staff member Kaitlyn Ranney spoke about many large-scale marketing and communications projects in development at FFI Headquarters, which included a reveal of the new FFI promotional video and a sneak-peek at the new FFI website. Finally, Jeremi closed the 2016 World Conference with heartfelt remarks and a reading of Dr. Maya Angelou’s poem, “Human Family.” As is tradition, delegates stood to join hands and sing “Let There Be Peace on Earth,” as the 2016 FFI World Conference in Marrakesh, Morocco concluded. FFI celebrated 40 Years of Friendship Force in the United Kingdom this past August! There was a fantastic lineup of speakers, workshops and plenary sessions planned for participants. Our opening night party took us back to 1977 when the Friendship Force began. The music, costumes, dancers, decor, food and atmosphere had members waxing nostalgic about the ‘70s. It was a great celebration of 40 years of this great organization. - to Scandinavia, Liverpool, Scotland, and Rambling in England's Peak District. - to London and Stratford-Upon-Avon. - Sucheta Rawal is an award-winning food and travel writer, author, cooking instructor and philanthropist. As the founder and executive director of Go Eat Give, Sucheta’s personal mission is to raise awareness of global cultures through meaningful travel, good eating, and community interaction. She founded Go Eat Give as a blog in 2011, through which she wanted to educated readers about sustainable and volunteer traveling, learning about authentic cuisines, and engaging with locals. Go Eat Give is now a 501(c)(3) registered non-profit serving audiences across 120 countries. Sucheta has traveled to 67 countries (and counting) bringing back exclusive experiences, which she shares through writing, speaking engagements and cooking classes. - Andrew Bowen, APR (Accredited in Public Relations), is the founder and principal at Clearview Communications and Public Relations Inc., a multi-disciplinary PR/Marketing firm Bowen founded in 2002. Bowen’s professional PR experience includes executive positions at two international marketing/advertising/public relations agencies, Ketchum and Fletcher Martin Ewing, where he led the Public Affairs Teams. His expertise encompasses all aspects of traditional and social media, media relations, newswriting, commentaries, speech writing, public affairs, crisis communications/crisis management and reputation management. - Jeanine Tousignant - President of Jeanine & Company, Jeanine Tousignant's philosophy is “Give where your heart is” when it comes to working with and advising donors and organizations about philanthropy and fundraising. Jeanine has worked with individual donors, companies, and foundations for over 20 years to help them maximize their giving to match their values. She also specializes in shaping nonprofit fundraising programs to match the right givers with the mission that matters to them. With this fundraising and relationship expertise, Jeanine is helping FFI clubs maximize their fundraising techniques and provides information about legacy giving (planned giving) to FFI members. Today, FFI’s President and CEO, Joy DiBenedetto announced the launch of the organization's NextGen Initiative, an exciting opportunity to help shape the future of Friendship Force International. For some time members have been pressing to include younger, working people. This new initiative will retain the pillars of home hosting and hospitality that are the hallmark of Friendship Force, yet make it possible for working people to discover the Friendship Force experience. "The best way to widen our `friendship circle' is to continue bringing down walls and building more bridges, bridges that cross language barriers, cultures, and generations. The first generation of members gave Friendship Force its global network of clubs and the baby boomers introduced the popular thematic exchanges. The Next Generation will expand that influence further. Research shows that meeting people of other cultures is the most important motivation for young travelers who seek authenticity and travel experiences that money alone cannot buy," explained CEO DiBenedetto. The NextGen Initiative will introduce several new travel/home hosting opportunities especially designed to appeal to the interests and energy of the Next Generation. Young leaders from 17 countries will constitute an advisory body reporting directly to the CEO. These leaders from various cultural backgrounds are ideally suited to adapt current exchange models to the interests of Next Generation travelers. They may also help connect Friendship Force to their own social networks, create and lead exchanges, as well as generate interest in Next Generation travel, home hosting, and hospitality. A team of experienced leaders, from clubs in every major region of the world, who will work with Field Representatives and club executives to attract clusters of young participants from local communities, and shape travel and home hosting around their interests. Mentors are already at work preparing the launch of an information campaign. Their role is to anticipate needs, provide training and promote best practices, all hands on guidance for clubs and leaders as this new initiative is introduced. Members of both the NextGen Council and the NextGen Mentors are outlined below. While the list of Mentors is complete, Council members will continue to be added in regions that are under-represented. NextGen Council members will report directly to the CEO, Joy DiBenedetto. Europe - Birgit Wagner, FF Varel, Germany, Club President; Serafina Haefeli, FF Solothurn, Switzerland; Dilek Sinlak, FF Karsiyaka Bay, Izmir, Turkey, Club VP; Arthur Smeers, FF Limburg, Belgium, Club President; Hendrik Schraa, Netherlands ESN. United States - Pilar Stella Ingargiola, Founder, Alchemy P4 Fund, OneGiving, Los Angeles, California; Guilaine Jean-Pierre, Director, engagesimply, New York, NY; Navneet Singh Narula, Entrepreneur, Atlanta, GA; Nicole Dow, Journalist, Atlanta, Georgia; Maria Ebrahimji, Founder, `I Speak for Myself', Atlanta, Georgia; Camille Feanny, Anthropologist, Journalist, Atlanta, GA; Pallie Savoie, FF staff, Louisville, KY; Pamela McNall, Founder, Let's Chat Productions, Atlanta, GA; Shawn Decareaux, FF Club Member-Missoula, Montana; Kelli Koogler, Content Strategy at SapientNitro, Atlanta, GA.
Latin America - Carolina Ardila, FF Bogota, Colombia, Member; Joel Aizprua, FF Discover Panama, Panama City, Panama; Simone Lanzoni, FF Ribeirao Preto, Brazil, Club President. Africa - Fredrick Bombo, FF Kampala, Uganda, Club Member; Joanna O. Mensah, FF Accra, Ghana, Club President. Asia - Ben Kantawang, FF Lamphun, Thailand, Club Manager; Atik Wijayanti, FF Solo-Surakarta, Indonesia, Club Manager; Bayar Lkhamjav, FF Mongolia, Club President; Ayu Trisna Bahar, FF Kuala Lumpur, Malaysia, Club Secretary. Canada - Max Jones, Founder, FeliceNews, Toronto, Canada. Middle East - Samarth Puri, President and Founder, TEAM HOPE, Kuwait City, Kuwait. Cécile Latour, Chair of the Strategic Planning Committee, FFI International Board of Directors will coordinate the work of NextGen Mentors. Europe - Boya Marshall, FF Hamburg, Germany, Club Member. United States - Patricia Meyer, FF Northern Illinois, FFI Field Representative. Latin America - Beatriz `Cuqui' Ardila, FF Bogota, Colombia, FFI Board of Directors; Celia Accorsi, FF Sao Jose do Rio Preto, Brazil, Club President. Africa- Maatjie Hoffmann, FF Cape Town, South Africa, Club President. 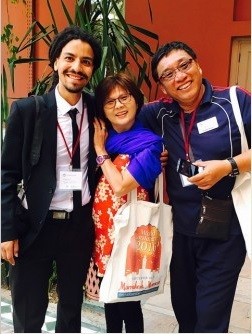 Asia - Tsuguyo Ishii, FF Western Tokyo, Japan, Club Member; Ivan Ng, FF Nanyang, Singapore, FFI Board of Directors. Canada - Murray Pink, FF Stratford St. Mary's, Ontario, Canada, Vice President. South Pacific - Debbie Lattey, FF Kapiti Coast, New Zealand, Club President; Bobbie Mulholland, FF Adelaide, Australia, Club President. The governing Board of Directors of Friendship Force International (FFI) consists of volunteers who contribute their time and expertise to overseeing the global operations of the organization. Board members serve four year terms. The current members are from nine countries. Most are experienced Friendship Force leaders, but several come from outside of FFI, adding a valuable external perspective. These are summaries only. For the complete policy, please refer to the full 2016 Club and Exchange Policy. Domestic exchanges may be scheduled between two or more clubs within a country after all their regular international exchanges have been confirmed for the coming year. Clubs are required to register the visit within 90 days of the exchange. These visits are designed to be shorter with less costly travel requirements than a regular exchange and as such are limited to 4 nights and one club visit at a time. These club visits are considered supplemental activities, and are not an alternative to regular international exchanges and domestic exchanges which are within the same country. In 2015, bank charges paid by FFI for payment by credit cards of various fees surpassed the year’s total rent for the FF office in Atlanta. These charges are unsustainable for our stressed organization and just as is the case in the commercial world, credit card users must assume a convenience fee for their use. A 3% processing fee will apply to fees paid by credit cards related to exchange payments as well as payments for participation in FFI World conferences beginning on January 1, 2016. This new policy will not apply to credit card payments for Legacy Fund donations or Club Affiliation fees and in these cases, FFI will continue to absorb the bank’s credit card charges. The `2016 Club and Exchange Policies’ are designed to provide guidance and FFI standards for carrying out our intercultural mission across the world. With more than 350 exchanges taking place each year, this set of directions provides a way for us to clearly organize our processes and make sure that Friendship Force programs are based on ethics and professionalism. Should you have any questions regarding these policies, speak with the staff at headquarters, with your club leaders, field reps, or international board members. We greatly value the efforts of all of our global Friendship Force community, and we look forward to a productive and peaceful 2016. At its March 2013 meeting, the FFI Board of Directors voted to increase ambassador fees beginning in 2014. Beginning in 2014, the ambassador fee for exchanges originating outside the USA will be US $140 per week, and the ambassador fee for exchanges originating from the USA will be US $165. The club affiliation fees for 2015 will be US $15 per individual and US $25 per family. These will be due with your club's charter renewal on January 15, 2015. A paragraph about club leadership transition has been added to the 2014 Club and Exchange Policies. Please note: The most current policies can always be found in the Club Resources section of www.thefriendshipforce.org, on the Documents page. Help for clubs is here! FFI now offers a Club Membership Growth video of membership growth strategies and the Media and Publicity presentation by Jean Hyrich of FF Manitoba given at the 2012 World Conference. Everyone you meet is a potential new member of your Friendship Force club. But how do you introduce the Friendship Force to someone who has never heard of it before? The most important thing is to be personal - tell them what the Friendship Force means to you! Here are some other resources to help you explain the Friendship Force mission and programs Find more information on FFIs Who We Are page. Watch the video or read the transcript. There you’ll find the Friendship Force history, mission, values and more. 2012 marked the 35th anniversary of The Friendship Force. Our mission — to promote global understanding across the barriers that separate people — is just as important today as it was 35 years ago. Ensuring a successful future is essential to our mission. The Global Expansion Plan comprises five initiatives for building a strong Friendship Force for tomorrow. Establish new clubs in all regions of the world, bringing the total to over 400 for the first time and opening new countries and communities to our global exchange program. From wine tasting and gardening to language learning and history, expand themed exchanges to attract a new generation of participants. Recruit, train and support volunteer leaders for tomorrow, with materials and techniques designed for a new generation of leaders. Increase regional, national and global recognition of the Friendship Force through the Internet, social media and global communications. WWorking together we can build a strong Friendship Force for tomorrow. France: The Friendship Force has a long, positive history in France, with two current clubs, FF Pau and FF Biarritz. We are hoping to open more clubs in France, and we are particularly looking for possible contacts in Bordeaux and Toulouse. Poland and Lithuania: We are eager to reintroduce the Friendship Force to Poland and Lithuania, particularly the Krakow region (southern Poland) and the Vilnius area (capital city of Lithuania). Canada: The Friendship Force is strong in Canada and well-equipped to support new clubs. We are especially interested in seeking contacts in the Vancouver area or Maritime Provinces. Themed exchanges create opportunities for new friendships to blossom from shared interests. For many ambassadors and hosts, the best parts of an exchange are the opportunities to discover all they have in common. Themed exchanges provide unique opportunities for Friendship Force members to come together around shared interests, such as gardening, language learning, hiking, history or the arts. Many successful themed exchanges took place in 2011, including a performing arts exchange in Hamilton and Burlington, Canada; gardeners to Cornwall, UK; renewable energy advancements in Colorado, USA; vintage travel in New Zealand; and the history, technology and culture of the Mississippi River in the US. FF Haliburton Highlands hosted a winter sports exchange in 2011 and again in 2012. Their guests learned the game of curling, went snowshoeing and drove a team of sled dogs. The FF Niagara club provided bicycles and helmets and welcomed ambassadors to join them on their favorite trails. Ambassadors and hosts cycled the region together, taking in all the varied scenery including the canal, the Niagara vineyards, and the beautiful farmland and orchards. George Brown, who has served as president of Friendship Force International since April 2004, will retire effective June 30, 2013. The announcement comes two weeks after the very successful conclusion of FFI’s 35th World Conference in Hiroshima, Japan, attended by over 400 members from 24 countries. In December 2012 the FFI Board of Directors approved the appointment of a search committee to guide the selection process for a new President to replace George Brown. The purpose of the committee was to work with a consulting firm to identify and screen candidates for the position and to recommend one or more finalists for final selection by the Board of Directors. I am writing to inform you of our CEO Joy DiBenedetto’s decision to leave Friendship Force International to pursue her own path and set her own pace. I regret her departure, as never before have I met a person more dedicated to an organisation, more connected to our mission of friendship, and more energized by the prospect to put FFI into the limelight. Joy joined us two years ago with a wealth of fresh ideas that made her the icon of change many had been asking for. She connected with people instantly. She so wanted to make Friendship Force relevant to the next generation and to bring the organisation into the modern world of online social interaction. This will be her legacy: she opened minds to possibilities. She stretched our minds so that they will never shrink back to their original dimensions. The journey will continue without her and we will find our own pace, but we should stay true to our destination. Change must come to FFI. We all care too passionately about Friendship Force to shorten our horizon. To ease the transition for everyone, Joy will stay in place as CEO until October 30, 2015. After that date, if the new CEO is not already in place, the Atlanta team can keep things going with the Board’s guidance on major issues. One adjustment we will make is to put the implementation of the e-membership initiative on hold and use the Vancouver conference to consult you further. The Board has done a lot of work on that policy only to conclude fundamental issues need more discussion. We are now developing an executive transition plan to assess priorities. Implementation of the fill-the-seat policy will continue and revised fees and policies for domestic and EU plus Schengen interclub exchanges will come into effect, as planned, in 2016. As for the search for a new CEO, Bob Duncan, Vice-Chair of the Board and known to you as the chief organizer of the New Orleans conference, will lead this effort. With these adjustments and your support, we can weather this transition. Our Atlanta staff is prepared. The staff reorganization announced last week was the culmination of a year of efforts to strengthen the team and instil more accountability. The retooling is underway. The catalogue of exchanges is now first class and, assuming we will get a good proposal, the Board will approve the installation of a new website and data system’s management over the September to February period. Our agenda is clear. We have an excellent strategic plan focused on enriching our exchanges and the program and revenues for 2015 are on target. Finally, the Board is strong and willing to help. I know that Joy leaves with a heavy heart. Her life commitment to peace and friendship dovetailed perfectly with Friendship Force. I thank Joy for her spirited contribution to Friendship Force. I wish her happiness and fulfillment wherever she goes. As the chair of the board of directors of Friendship Force International, it gives me great pleasure to announce the appointment of Joy DiBenedetto as FFI's fifth president and CEO. Joy brings a great deal of experience to FFI from her years at Atlanta-based international news agency CNN and CARE Organization, the non-profit based in Atlanta that works to end poverty in the world. Those on the search committee who met her feel that she has the skill and vision to lead our organization through the next phase. Joy will begin her work here on July 15, 2013, and we will formally introduce Joy to the club members at the world conference in New Orleans. Joy DiBenedetto will begin as FFI President and CEO on July 15, 2013. Joy is the founder and former CEO of HUM: Human Unlimited Media, the world’s first and only ‘all-nation' content and information agency. An award-winning 20-year media veteran, she has covered every major global event in successively senior positions, from the television studio and in the field; domestically and internationally; as a producer and manager. Until March of 2008, she was the global vice president of network booking and research for the CNN News Group, where she oversaw guest coverage for CNN’s domestic and international news networks, managing a worldwide staff. Throughout her career she has strived to promote the importance of global understanding and to unite the world’s people. With Turner Broadcasting, CNN and HUM she made positive change towards “closing the Geographic Gap” in media coverage. She has also pursued various humanitarian efforts with CARE, the Fugee's Family and the United Nations. DiBenedetto is a world trekker who often bicycles to work and who has survived Dengue Fever. I know you will welcome her and give her the support that the President will need as we strive to grow in our mission. It is only fitting to give a big thanks to the CEO search committee who worked for the last 7 months to bring us to this day where I am able to make this announcement. Again, I welcome Joy to the FFI family and I know you welcome her too! Bob Duncan of FF Baton Rouge has been elected to the International Board of Friendship Force and is stepping down from his position as field Representative for the Southwest Region (Kansas, Baton Rouge, New Mexico, Oklahoma, Austin, Dallas, Fort Worth, Houston and San Antonio). Thanks to Bob who has served the Southwest Region for the past two years. We appreciate all the hard work he has put into serving the mission of the Friendship Force. John Heard of FF New Mexico, will be serving the Southwest Region for the next two years. His e-mail address is: johnheard2@msn.com. In 2012 new guidelines were developed for how to recruit ambassadors (and hosts) who are physically and mentally capable of carrying out the basic requirements of the exchange. This is very important, and FFI will monitor closely all exchanges to ensure these guidelines are followed. Clubs failing to abide by these guidelines will be required to make changes in their recruiting procedures. In order to ensure proper recruiting, it is the responsibility of the host exchange director to provide the ambassador ED with details regarding hosting activities. A new checklist has been prepared by FFI for use by the host exchange director for this purpose. The ambassador ED is required to accept only people capable of carrying out the hosting activities—unless an exception is granted by the host ED. In May 2015 the health and mobility policies were clarified to address cognitive issues in addition to physical issues. The policies state that applicants with unique challenges are welcome on exchanges so long as any special requirements are made known to the host ED in advance and can be met by the host club. See the Health and Mobility Checklist - a pdf file. Click here for the FFI policies in English. If you have any questions or suggestions or need to report difficulties with this policy, please contact Kathy Thomas at kthomas@thefriendshipforce.org. Taking the place of the print magazine FFI used to publish, Friendship Online magazine will now come to you as a link in an email every two months free of charge. Inside, you'll find fascinating stories, important news, leadership ideas and reflections on the FFI mission from staff and volunteers like yourself. We hope you'll enjoy reading Friendship Online, and we hope you'll pass it on to your friends. Friendship Online is a great tool for showing your community what the Friendship Force is all about. Dated 2/9/09: Recently we have had reports of emails purporting to be from bona fide Friendship Force members requesting money to get home. These emails are as a result of our members' email accounts having been hacked into and taken over by criminals. The criminal pretends to be a fellow member and emails everyone in their contact list. THESE EMAILS ARE SCAMS. DO NOT WIRE ANYONE MONEY THROUGH WESTERN UNION OR ANY OTHER FINANCIAL INSTITUTION AS A RESULT OF ONE OF THESE EMAILS. We regret anyone being inconvenienced by one of these emails, however FFI takes your privacy seriously, we do not sell our contact lists and we cloak all emails in our communications to our members as much as possible. We continue to look for ways to ensure your privacy. When traveling with Friendship Force and you have a true emergency you should always first contact your Exchange Director, our emergency number (404 522 9490 ext. 375), the relevant Consulate and your Program Coordinator. - Do not reply to these emails. This puts your computer and email account in danger. immediately. They might be able to shut it down before any harm is done. can to make our site safe by cloaking email addresses whenever possible. make sure you log off once you are done. special software for it. Protect your information and that of your friends. - And always be suspicious if the sender of an email asks for money. Many Friendship Force people are signing on to Facebook - just type in Facebook on your top line of your browser and you will be taken to the Facebook website to join or sign in if you are already a member. It lets you share photos with friends, with people you have stayed with, with club members. Share exchange photos and keep in touch worldwide. There are groups within Facebook, and one of them is a Friendship Force group. You can set up your own group too. With any social sharing site, just be careful what you put on there. Theoretically, you are allowing only your friends whom you have approved to see what you put there, but actually their friends may see your postings too. There have been cases of scams and people defrauded when their Facebook password was used to steal their identity. People can assume your identity, change your password and appeal to your friends for “emergency” money. This problem occurs if you respond to a request on your e-mail for information or click on a link taking you to a scammer’s site. That’s really where you need to be careful. When you get a request on your e-mail from an organization, bank or company that looks familiar to you, do not click on a reply link. Respond if you wish by going to that company’s website or use your own address book. That request could come from someone mimicking that company and providing you with a link to their scamming address; you may not be talking to the company you think you are. Reputable companies do not ask for information online that would compromise your identity. Beware of any that do. When the whole world sees you, you need to weigh what you put on your website. We (in Dallas) don’t print our members’ phone numbers or home addresses. If a meeting is in a private home, we provide an e-mail address as contact to get the address. We figure if the viewer is seeing this on the Internet, he or she has e-mail and can use that to contact a person mentioned on our site. An e-mail address does not identify location of the person or confidential information; however, some people object even to using their e-mail address or last name in a newsletter or website. If you have a member who objects, respect their privacy. Friendship Force merchandise make wonderful presents for members and non members to use as gifts. Order them in advance so we can combine several orders from around the world to meet the minimum orders - a measure to keep our inventory low and to save you money! Please note: if we do not meet the required minimum you will be notified and you will NOT be charged for the products. We all know that FFI has a great story to tell. We also know that we live in an age of information technology. So, we are maximizing our piece of cyberspace by using our website to help us get the word out about our organization and its activities. Our new homepage is designed to be fun, attractive and interesting to our members and to the general public. The website is useful in getting the word out about Exchanges. Here’s what the terminology means: Featured Exchanges provides a sample of upcoming exchanges that are open to applicants from outside the originating club. Currently these exchanges originate in the USA but anyone, anywhere in the world, may apply. We will also be adding exchanges of interest to members from other regions in the future. In addition to the Featured Exchanges we still have the All Exchanges listing as well as Find an Exchange, both of which provide a full listing of current exchange activity. We’re entering the age of web-videos with the new website, providing the opportunity to include short videos for those with fast internet connections. The new website includes the video about the new logo and strategic plan. We have an on-line Friendship Force store for the first time. You can order merchandise with the new FF logo directly from an internet supply house called “Café Press.” We’ll be adding additional merchandise items including a standard logo lapel pin — that will be supplied from FFI in Atlanta. One of the most important features of the new website is a special section for club and exchange leaders. This new leadership section is much stronger. And to avoid confusion for members and the general public who may be using the website to learn about FFI, a password will be required for the leadership section. We want all active FF leaders — both club and exchange leaders—to have access to this section, which we’re calling the Leadership Forum. We are asking that club presidents give the password to exchange directors and other leaders who may have need of forms, manuals and other leadership information. The Leadership Forum section is also designed to be interactive, providing a way for you to communicate with each other and with the FFI staff on an ongoing basis, using “blogs” (web-logs). This means you can enter comments and suggestions that can be seen by FF leaders around the world. Give it a try! Or you can send an email directly to me through the website in the “Talk to George” section. I think it will be fun and also very productive. Since we will now be calling our entire leadership section in the website Leadership Forum, the name of our monthly communication which you have been receiving by that name will now be called the FFI Communiqué. We’ll continue to send this via e-mail, with back issues saved on the website in the leadership section. There is no doubt that the Internet is a tremendously powerful tool for a global organization like FFI. In addition to providing the world access to our story and our programs, it also enables us to greatly improve communications between FFI and our clubs. It won’t always go just the way we want, but we can learn together and in the process create a much more efficient and effective international organization. I’m looking forward to working with you to make this a reality! What should we use this mailing address for? Jeremi Snook is the new President of FFI and Debbie Powell is our Program Service Coordinator in Atlanta. Noriko Kanamoto joins the FFI staff in a new position as the Program Services Coordinator for Japan. Noriko is based in Japan, where she will coordinate Japanese exchanges and assist Japanese clubs. She is taking over these responsibilities from Maryam Jordan, who will continue to work with clubs throughout the rest of Asia. Noriko will also translate important documents and facilitate communication between FFI and the Japanese clubs. Maryam Jordan and Tsuguyo Ishii will work closely with Noriko as she begins her work with Friendship Force. Noriko can be contacted at nkanamoto@thefriendshipforce.org. Read her bio on the FFI website here. Check the webpage for Friendship Force International news, all exchanges, clubs around the world, products for sale and the Friendship Magazine.